Graduate student Michael Kipp speaking to Lakewood High School students. While astrobiology is a relatively young field, it has a secure and promising future. Astrobiology research has a significant impact on how agencies such as the National Aeronautics and Space Administration (NASA) and the European Space Agency plan for current and future space missions. For example, many recent missions have focused on exploring worlds in our own solar system for signs of past, present or the precursors of life, including Mars (Phoenix , Pathfinder , Global Surveyor, and others) and Titan (Cassini-Huygens). At the same time, significant advances and investments in telescope technology (Kepler, James Webb Space Telescope) have allowed researchers to begin planning and searching for habitable planets outside our solar system. As the field of astrobiology has grown, there has been an increased need to train the next generation of astrobiology researchers and educators. This is why, in 1999, the University of Washington established its Astrobiology Program (UWAB) – an interdisciplinary education and research program dedicated to advancing our understanding of current astrobiology issues and training the astrobiologists of tomorrow. 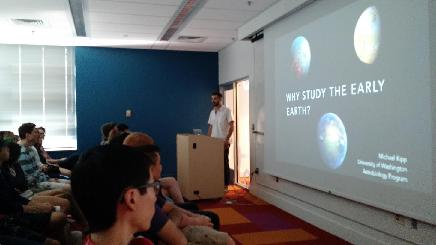 UWAB is home to many cutting edge research projects, an internationally recognized graduate program, and an ever-growing collection of teaching-and-learning resources for astrobiologists and astrobiology enthusiasts of all levels. How Can I Learn More about Astrobiology?